Studies continue to show that the physiology of an individual's smile is connected to confidence, happiness, and even success. In fact, a smile contributes to the release of endorphins, which are molecules located in the brain that elevate one's mood, and those that smile more often are perceived as strong and self-assured. Even so, for those with dull or stained teeth, they may not smile at all. That's why the team at Lawrenceville Family Dental Care is proud to offer the revolutionary Guided Light Optics (GLO) Teeth Whitening as part of our cosmetic dentistry treatments. Not only is GLO Teeth Whitening fast, affordable, and user-friendly, it provides sensitivity-free results and no "zingers," which are associated with other teeth whitening systems. With one in-office procedure, teeth are brightened quickly and painlessly with a heat and light combination in a closed mouthpiece. Unlike trays and strips, this technique prevents oxygen from escaping the surfaces of teeth, and ensures that results are effective and long lasting. Following treatment, patients take the mouthpiece home for additional sensitive-free whitening as needed. Are you hiding your smile? Perhaps you have sensitive teeth, and you've given up on having a brighter smile. With GLO Teeth Whitening Technology, you can finally achieve your brightest smile—with zero sensitivity. 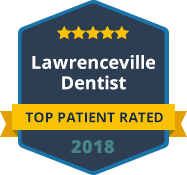 Contact Lawrenceville Family Dental Care today. Why is GLO Whitening Superior? Providing a dual teeth-whitening experience that is sensitive-free, the Guided Light Optics (GLO) Technology is a groundbreaking solution for patients seeking their brightest smile. This is one reason why GLO Whitening is superior to other methods, including trays and messy strips. In a single dental visit, patients experience brilliant results quickly in an accelerated process through a closed mouthpiece. Not only does this prevent whitening oxygen from escaping, it protects soft tissues from coming in contact with whitening formula that would otherwise cause sensitivity. In the same way, patients continue treatment as needed at home with patented GLO whitening gel that adheres to teeth without seeping onto gums. Specifically, patients apply the gel from a vial, attach their mouthpiece, and press the GLO button. As a hands-free design at home, patients enjoy easy teeth whitening in intervals of 8 minutes. To experience the brilliance behind GLO Teeth Whitening, contact Lawrenceville Family Dental Care today to schedule an appointment.